High-end graphics package for the Touchscreen. Picture Perfect includes pie, bar and line charts. 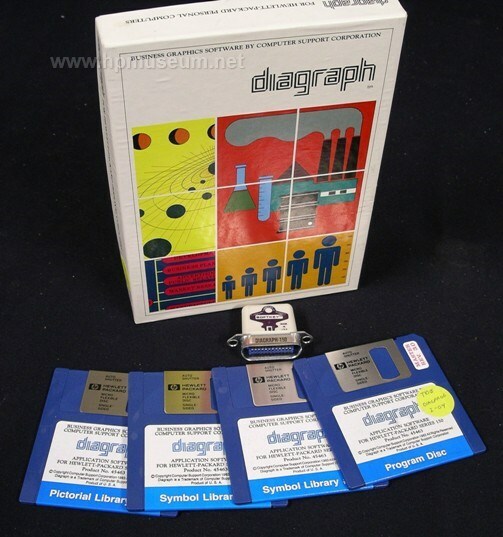 Diagraph is a clip-art graphics program. VERBRCHT: Picture Perfect Vertical Bar Charts. These programs cannot be run without the hardware protection "dongle" that plugs into the HP-IB port. These dongles can be made using the connector end of an HP-IB cable, 2 diodes and a push button switch. Start by removing the connector end of the HP-IB cable from the cable itself (we used a hacksaw). (1) connect the CATHODE end of diode1 to pin 15 (DIO7) of the 24-pin connector. (2) connect the CATHODE end of diode2 to pin 1 (DIO1) of the 24-pin connector. (1) connect the CATHODE end of diode1 to pin 14 (DIO6) of the 24-pin connector. (2) connect the CATHODE end of diode2 to pin 3 (DIO3) of the 24-pin connector. Click on "More Images" below to see a pin out configuration for the HP-IB connector and to see a photo of the finished product.